1. What's the confusion over pedigree, mixed breed and crossbreed pets? 2. What is a pedigree dog? 3. Are pedigree dogs more expensive to insure than mixed breeds? 4. What is a crossbreed dog? 5. What is a mixed breed dog? Is a Labradoodle a crossbreed or a pedigree? Does it depend on its parents or who is asking the question? We aim to demystify how breeds are defined and the impact they have on pet insurance prices. Bought By Many has a range of unique policies including Complete cover with £15,000 of vet fee cover. What's the confusion over pedigree, mixed breed and crossbreed pets? Different people or organisations have their own definitions of pedigree dogs. Some owners feel a pedigree dog has to be recognised by and registered with The Kennel Club, while others believe if its parents are the same breed it can be classed as a pedigree. When getting a pet insurance quote it's important to use the definition given by the insurance company, even if it differs to yours. If you don't, you could end up paying more than necessary or having a claim rejected. Some people use the terms pedigree and purebred interchangeably (as we do here) but to others, purebred means the animal’s parents are of the same breed, whereas pedigree means its breeding history has been recorded. 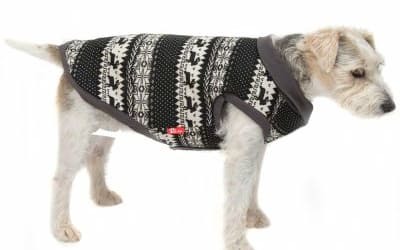 We’re here to help you tell your mutts from your Morkis and your Spaniels from your Schnoodles – and get a fair deal on insurance while you’re at it. We've also written a guide to the best pet insurance for dogs. You can also join our pet insurance group to find out more about Bought By Many's unique pet insurance policies. So if your dog has two Pug parents, that means you’ve got a pedigree Pug. And if both parents are Puggles, it's a pedigree Puggle. Many insurance companies do not care if a breed is recognised by The Kennel Club (for example, Pugs are, but Puggles are not). Away from insurance, some people take the term pedigree to refer to purebred dogs that are registered with a breed club. But even within this categorisation there is a grey area because some argue that there are breeds that started out as a crossbreed but have been around long enough to be classed as pedigree. Our Complete policy has £6,000 of cover for loss and theft to cover the cost of expensive pedigree breeds. Are pedigree dogs more expensive to insure than mixed breeds? Some pedigrees are more likely to have health problems than crossbreeds and mixed breeds because they are less genetically diverse. Some common congenital conditions are epilepsy, which is often inherited by Cocker Spaniels and German Shepherds, and entropion (a curling of the eyelid) common in Shar Peis. Some breeds, such as Golden Retrievers, can also inherit serious ailments such as subaortic stenosis (SAS). This condition causes a narrowing of the blood passageways and can lead to heart problems. Often, these pedigree dogs will be more expensive to insure than other breeds. Remember, your insurance premium will also depend on other factors such as the age of your dog and where you live. And insurers are unlikely to insure pets that have pre-existing conditions. However, Bought By Many has a pet insurance policy for pets with pre-existing conditions. This is the only policy on the market that will cover dogs and cats with pre-existing conditions. We made this policy after hearing from thousands of pet owners who didn't think pet insurance companies were giving them what they needed. And check out our guide to the cost of dog insurance for more information about prices. What is a crossbreed dog? The term crossbreed refers to dogs with parents from different breeds – for instance, a Labrador and a Poodle creating a Labradoodle. In that example, the first generation Labradoodle would be classed as crossbreed by many insurers. But if you bred it with another Labradoodle, their offspring would be a pedigree Labradoodle according to some insurers. Sometimes crossbreeds are bred together for a long enough time and they are eventually considered a new pedigree breed. The Cesky Terrier is an example of this and is recognised by The Kennel Club. Some of the most popular crossbreeds are Cockapoos and Labradoodle, and are sometimes referred to as designer dogs. These two crossbreeds aren’t recognised as their own breeds by The Kennel Club. Designer dogs can be crossbreeds or pedigrees in the eyes of insurers, depending on what list of breeds they recognise and whether their parents are the same breed or not. Some insurance companies will ask for the dominant breed of your pet to work out your premium. The dominant breed of a crossbreed could be either its father or its mother. To find out the dominant breed it’s best to consult your vet’s records. Thousands of pedigree, crossbreed and mixed-breed pet owners have joined Bought By Many because our unique cover met their needs. Find out why. What is a mixed breed dog? A mixed breed dog, also known as a mutt or a mongrel, is a mix of three or more breeds. For some, the true definition of a mixed breed is that it hasn’t been intentionally bred, which implies a crossbreed has been. Most insurance companies won’t take this into account, though. It doesn’t matter to them whether your dog's breeding history was intentional or not. For insurance, the definition of a mixed breed tends to be a dog with a mix of three or more breeds. Animal Friends says that if you are unaware of which breeds your dog is crossed with, or if it is crossed with more than two breeds, then it counts as a mixed breed. However, they say that the information your vet holds on your pet could make a difference to how they define the breed. If your vet says your dog is dominantly one breed, Animal Friends' records would have to match this. Mixed breed dogs can have fewer genetic health problems than purebreds. For this reason, mixed breed dogs can be cheaper to insure than some pedigree dogs. If you're getting a pet insurance quote for a mixed breed it’s useful to know its weight because it will affect your price. There are usually three classifications: small (up to 10kg), medium (10-20kg) and large (more than 20kg). Insurers generally don’t need this for pedigree dogs because they have estimates for known breeds in their system. Remember, whatever your definition of a pedigree, crossbreed or mixed breed dog, insurance companies will have their own classifications, which will affect the cost of your insurance. Read their help text or policy documents carefully to make sure you’re paying the right price and getting the cover you need. When getting a quote through More Than, some crossbreeds with designer dog status, such as Labradoodles, also appear in the drop-down list for pedigree. 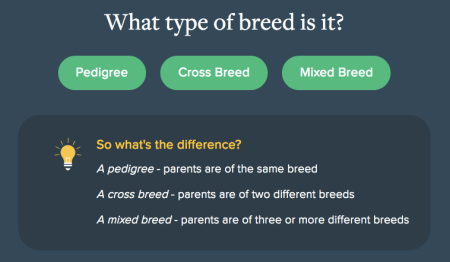 We asked More Than about this, and they said that even if you have a crossbreed which has two of the same parent - for instance, a Labradoodle having two Labradoodle parents - you should always select crossbreed, not pedigree. In the case of another insurance company, Lifetime Pet Cover, regardless of whether your Labradoodle had a Labrador and a Poodle for a parent or two Labradoodles, the premium would be same - so at least for one insurance company, it shouldn't make a difference how you classify your crossbreed. Remember that this might not be the same for all companies. You can get a quote for a pet of any age through our pet insurance for older dogs group. As with dogs, different organisations may have their own definitions for breeds of cats. A pedigree or purebred cat is usually classed as a cat with two parents of the same breed. Again, purebred cats are at higher risk of inheriting health conditions due to a shallow genetic pool. Siamese cats are more likely to have respiratory diseases than mixed breed cats. Often, insurance companies will only give you the option of choosing between a pedigree and non-pedigree cat. Sometimes, even if you pick the non-pedigree option, you will still be asked to choose your cat’s breed. Some insurers also ask you to include the colour of your cat when selecting the breed. Bought By Many has a group for cheap cat insurance for older pedigree cats. Insurance companies might include the option to pick crossbreed or Moggy (sometimes spelled Moggie). A Moggy is a mixed breed cat, usually defined as such when you don’t know the breed of its parents or if its parents are of three or more breeds. But there are exceptions. On the VetsMediCover pet insurance form, Moggy is not an option. You have to pick either Domestic Short Hair, Domestic Medium Hair or Domestic Long Hair. However, on the John Lewis quote form, you can pick either Moggy, Moggie, Domestic Long Hair or Domestic Short Hair. It is important that you know the breed of your pet otherwise you might end up paying more than you need to or accidentally select cover that is not valid. Other factors, such as your cat’s age and where you live, will affect the price of your premium.